Ochanomizu (お茶の水) is a neighborhood in Chiyoda. It is also known as shopping district for music instruments. It is the best spot to buy your music instruments. Not only they have great guitars, but also they have installments like violins or wind instruments. You can find the band score book for Japanese music and songs here. 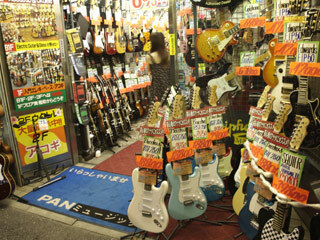 There are many shops which has all kinds from great classic and antique guitars to low price guitars for the beginners. You can also sale your instruments here. Most of the shops close around 7 p.m.
Ochanomizu is a neighborhood in Tokyo, Japan. It extends from the Yushima section of Bunkyo-ku to the Kanda section of Chiyoda-ku. Meiji University, Tokyo Medical and Dental University, and Juntendō University all have main campuses in the area. Ochanomizu Station on the Chūō Line is the transport hub of the district. Prior to the Great Kantō earthquake, Ochanomizu University was also there; after the earthquake, it moved to its present location in the Ōtsuka neighborhood of Bunkyo-ku. Ochanomizu is also the location of the Holy Resurrection Cathedral (Nicholai-dō). Ochanomizu is famous for its many musical instrument stores, as well as ski and snowboard shops located a short walk from the station; it is known as the "go-to" district for bargain-conscious musicians and sportsmen. Ocha-no-mizu literally means "tea water", after the nearby Kanda River from which water was extracted to make the shogun's tea during the Edo period.